Abstract: When the time comes and you need to get more informed on networking - for work or for certification - a book like this is a good place to start. If you work in the IT field you probably spend much of your time fiddling around with network settings, and occasionally reinstalling coworkers computers because of evil programs like AOL instant messenger, ICQ or IM. Just like smoking, these three programs seem to have the power to kill systems - don't ask me why I have no idea. Anyhow, faced with the always pleasant reinstall of Windows because of kamikaze messenger programs or because of the natural six month expiration of Windows, those 45 minutes of waiting are the perfect time to read. Now given the number of computers I seem to be reinstalling around here, a book like Cisco Press's Computer Networking Essentials which sits at a comfortable 735 pages, should be readable in a week or so. Contained within the magical covers is everything you ever needed to know about networks, and network settings. More of a handbook to the IT department, or a text book for those dot.com executives who want to talk the talk with their techies, Computer Networking Essentials explains in remarkably understandable English the tools and technology that we deal with every day. 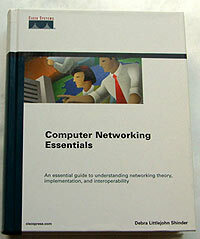 Broken in to four main sections that include Introduction to Networking Concepts, Networking Hardware and Software, Network Specialty Areas and Future of Networking the book by Debra Littlejohn Shinder is full of extremely useful information - even for us so-called experts. Those of you studying for your MCSE take note, most of the info in this book is useful for the Windows 2000 core exam. From simple tasks like configuring Windows 2000 on the network to getting your graphic artists' G4 on the network with the rest of the PC's - yes it can be done so long as your computers are running Win2K and have the proper services loaded for AppleTalk communication apparently - Computer Networking Essentials covers it well. The detail in the explanations differs from chapter to chapter and in most cases is merly explanatory, but does point in a direction to head towards should you need more detailed information on a question. With security becoming a serious concern for websites all over the internet, the section on Internet security is of special interest. Covered are DOS attacks like ping flooding, smurf attacks, ping of death, SYN attacks, and several other external and internal methods of security breaches. Again, the book touches on each topic in such a way as that the first time user, or novice will be able to understand. It does not go into detailed explanations of the techniques or resolutions because the books is more of a primer than anything else, but still chalked full of useful info. When the time comes and you need to get more informed on networking - for work or for certification - a book like Cisco's Computer Networking Essentials is a good place to start. It is not geared towards experts in networking but designed more for those of us who have patches of knowledge about networking techniques and technology. We found it to be a very good introductory text and even helped us out with a couple of explanations we were fuzzy on. By incorporating a broad range of topics that deal not only with the theories used in everyday networking, but also exploration into the hardware, software and implementation of these technologies the book forms an essential tool in any IT departments toolkit. And as always, it makes great reading material while waiting for Windows to install!